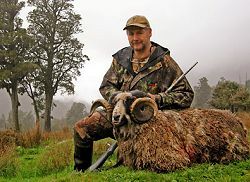 about our Wilderness Quest New Zealand - Mega Hunt package. Private Preserve Hunting is at Haupiri Valley, which is nestled at the base of mountains with stunning views, snow fed rivers, and lakes. We hunt an area from the river valley to a gradual mountain slope including all the natural forest and tussocks, at the top overlooking the entire valley. This is not a piece of cake hunt, so try to get your legs in shape. On the other hand we will cater to all types of physically fit hunters to give them the best experience possible. Tahr hunting can be a very physically challenging experience, which takes the hunter high into the snow and ice of New Zealand's rugged alpine country. However with the right hunting guide, this can become a hugely satisfying and successful challenge, with a magnificent trophy as the ultimate prize. Chamois can be hunted all the year round but the rut season is most preferred, around May to June, at this time they sport their thick dark winter coats which turn to a golden tan in the summer. However some hunters prefer their golden summer coats as they make attractive trophies as well. The Arapawa ram is mostly dark brown and black with white markings, with an average ram having 1 to 1� curls on each side. A ram with double curls is considered exceptional, however this won't always guarantee length. Some heavy single curls can also carry good length. These trophy animals can be hunted on Wilderness Quest's preserve, or along the wild river flats. Trophy feral billies can be hard to find and a hunt can be an exciting addition to your hunting experience. Hunts for these trophy animals occur on Wilderness Quest's Haupiri Valley estate. This is a true wilderness experience with luxurious new modern 2008 lodging right on the river, and great brown trout fishing right at your front door. Learn more about and see photos of Wilderness Quest accommodations.